From 11th to 18th of February in a picturesque location just outside of Moscow the 42nd traditional ITEP Winter School took place, this year also organized by Department №7 and Laboratory №366 of NRNU MEPhI. The participants of the school included graduate and postgraduate students and young scientists from eight countries (Russia, Belarus, Belgium, Germany, France, Kazakhstan, Ukraine and Vietnam); among them were five representatives of NRNU MEPhI. During the event, the young scientists attended lectures by the world’s leading scientists. From the Higgs boson physics (S. Heinemeyer) to the flavour physics (A. Stocchi, P. Pakhlov), and to the new results from the LHC (L. Rolandi) the School program included also cosmology (A. Dolgov), dark matter (M. Lindner), quarkonia (Y. Kalashnikova, R. Mizuk) and neutrino physics (Zhi-zhong Xing). Moreover, the higher spin gauge theories were discussed by M. Vasiliev and the status of the ILC was presented by the head of the school M. Danilov. As a part of the School, a forum for young scientists took place, allowing the participants to present results of their researches. The best works were awarded diplomas. The choice of the best presentation on theoretical and experimental research was based on the vote of the School participants and the opinion of the organizing committee. 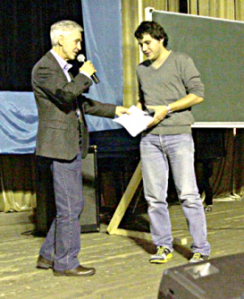 Thus, the award for the best experimental research presented went to Alexander Novikov, postgraduate student of the Department №7, NRNU MEPhI. The culmination of the School was the ski competition (on the photo), during which the young physicists and the renowned scientists fought for the title of the fastest. The first MEPhIst to complete the distance was Mikhail Danilov, the winner of the 3rd place.